SCAD is collaborating with Walt Disney Imagineering to research and develop design concepts to improve the guest room experience, including both services and entertainment, using technology. The Collaborative Learning Centre at the SCAD gives selected students real-world experiences with outside companies. For this project, a multidisciplinary team of 15 designers and 2 professors collaborated with Walt Disney Imagineering R&D. For this project, I contributed as the Content Manager and a Service Designer. As the project's Content Manager I was contributed to the Agile Management System. 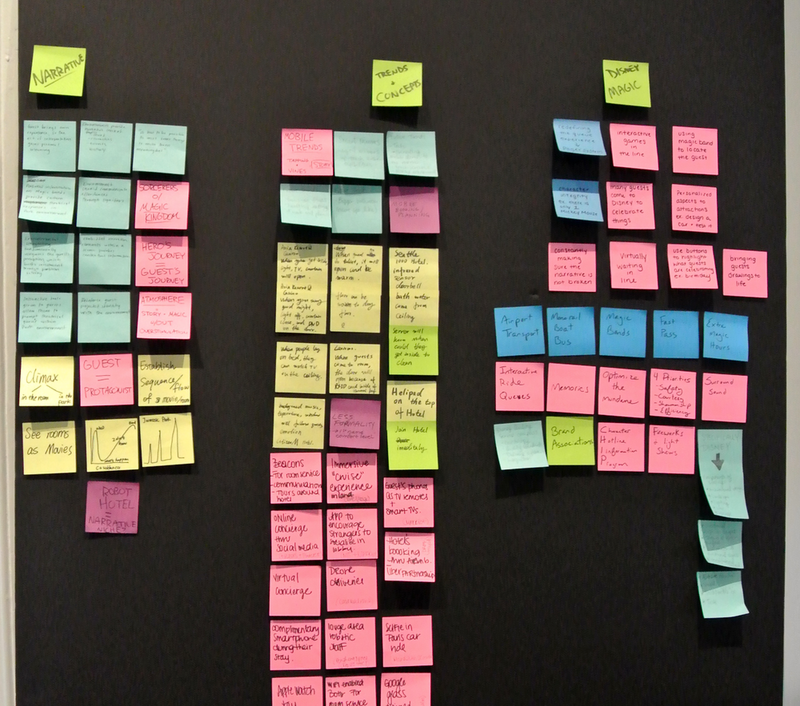 My responsibilities included updating and keeping the Sprint backlog and content up to time. As a Service Designer I contributed collaboratively to the project's research phases, research synthesis, service design thinking maps, ideation and prototyping. Below are the details of my contribution to the project. With the team, we visited 3 resorts in Orlando to conduct primary research. While in the resorts, we conducted observations to understand the current Guest room experience at Walt Disney World Hotel resorts. Also, I helped conduct interviews with Cast Members and Guests. To better understand the business environment, I collaborated with different team members to research industry trends and innovation in the industry. Once the data was found I shared and presented the findings with the team to later show the whole group a synthesise version of our research findings. After gaining a better understanding from primary and secondary research (business environment, the current Guest room experience, Disney's offerings, technological trends) it was time to synthesize the research to find insights. Collaboratively, we affinitize the different levels of research to uncover our key insights. These insights were later used to ideate our concepts. Also, we used a synectics session that helped align the research with the brainstorm phases. 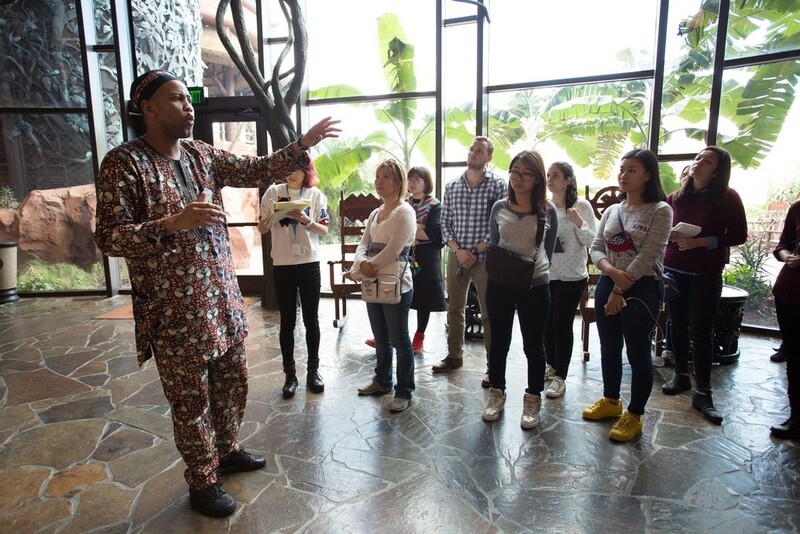 Using Service Design thinking methods helped us gain a better understanding of the Guest's complete vacation experience. Understanding the pre-experience, during-experience and post-experience helped uncover opportunities to innovate and solve for potential pain-points. The service blueprint is composed of different layers that explain the various levels of service interactions that Guests come in contact with directly (front stage) or indirectly (backstage). It explains the activities that happen ‘backstage’ that Guests don’t see, but have to be included in order for the service to be provided. The service encounters map is a tool used to identify the activities that trigger Guests’ interactions with Walt Disney World Resort services. It shows the touch-points in which Guests interact with the Resort before, during, and after their stay. Primary research allowed us to identify different types of Guests that visit Walt Disney World Resorts. By using a bipolar opposites matrix we were able to map extreme personality traits, motivations, age groups, and budgets to create different types of personas. The purpose of this matrix is to cover a broad range of characteristics to incorporate into the personas, in order to create solutions and concepts that could be applied to a diverse Guest range. After selecting the four main and extreme Guest types from the Bi-polar Matrix, we created different personas. A user journey was developed for each one to better understand the motivations behind their stay at a Walt Disney World Resort hotel. 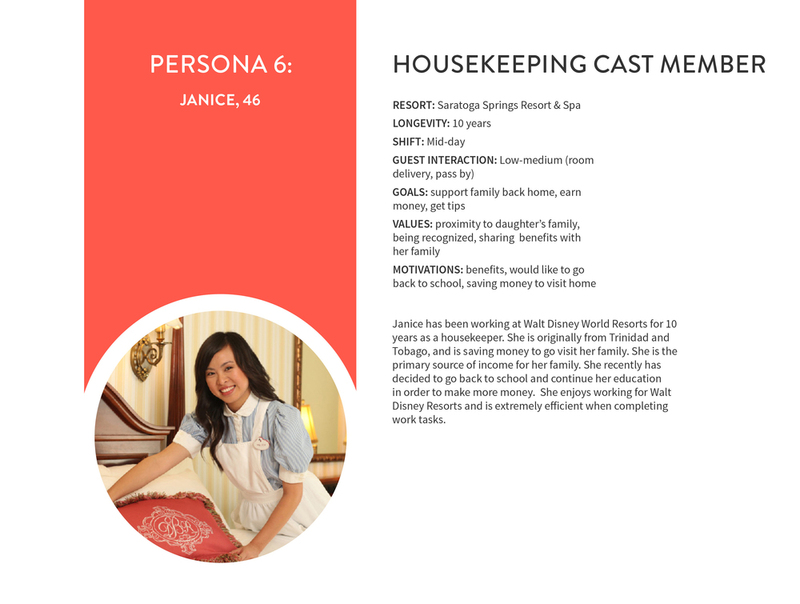 Personas for two Cast Members were also created since they are an integral part of the service delivery. Why use Guests (user) Personas? By using personas we were able to put ourselves in a specific Guest’s shoes and understand the Resort experience through their eyes. This process allowed us to tailor the solutions and concepts to Guests’ specific needs, aspirations, and the things they value. Why use Cast Member (employee) Personas? During the research process, from the Guests interviewed and surveyed, we found how much the Cast Members impacted their stay. Since Cast Members are an integral part of the service delivery, the solutions should keep them in mind, and by developing personas around them, we made sure that they were included in concept development. The team, later split into 3 ideation teams. Using the insights and user-centered design methods (personas, service design maps) we generated ideas that reflected Guests' needs. As part of the Everyday magic team, we focused on ideas that will add "magic" to even the mundane everyday activities the Guests have to complete while on vacation. For example, magical picture frames in the room and a room that uses technology to responds to the Guests' emotions. Using a design criteria based on client specifications we filtered our ideas and concepts attributing each concept with an individual score and analysis to help us decide a direction. With a crafted story we presented the journey of The Santos, our most diverse persona, through the new Disney Guest Room experience- illustrating our concepts. Concepts ranged from advanced and automated baby cribs to a centralised nightstand hub for convenient control of the room’s main functions, modular furniture, 'Siri-esque' personal assitants and cutomized floor and wall projectors. Following the midterm presentation, we complied with Disney's request to concentrate on the typical Guests that stays in a Disney Resort, a family of two parents and two children (ages 6 and 10). To move forward with this approach, we created a archetypal family to target when crafting new and refining existing concepts. The Disney partners directed us to hone in on two main areas of focus in final solutions: projection mapping technology and the zoning. With these areas of focus we segment the Guest room into emotional and behavioral modes that the family would enter and exit at varying points during their stay. We mapped which mode each family member might enter during their actions in the room so that final concepts could be catered towards encouraging these transitions, based on Guest needs and desires. As part of the zoning team I contributed to research, ideation and the production of two concepts prototypes. After analyzing the feedback received at the Midterm meeting, we began by researching current applications of the micro-housing development, transportation passenger comfort, and the innovation of modular furniture. Upon understanding and analyzing how a space can be divided and zoned in these case studies, we began to sketch and ideate new concepts- concepts that achieved the application of zoning the room. We continued to refine the concepts into four loose experiences and explored the potential of different theming opportunities. The ideation was then filtered through the team’s design criteria matrix, attributing each concept with an individual score and analysis, pertaining to its effectiveness in matching the criteria set forth by the client.